Celebration highlights one-year of providing continuous care and support to troops, their families and caregivers on campus. Over the last year, the USO Warrior and Family Center at Bethesda has become an essential part of the fabric of Naval Support Activity Bethesda. One year ago today, the USO cut the ribbon on its second Warrior and Family Care Center in the United States and changed the landscape on Naval Support Activity Bethesda forever. The more than 16,000 square feet facility has served more than 100,000 troops and military families in the last year, almost 50% of these visitors were wounded, ill and injured and their families, proving to be a valuable resource to one of the nation’s largest military medical centers in the country. After opening its doors on the campus that houses Walter Reed National Military Medical Center, the center has truly become a home-away-from home for those seeking treatment and their families. 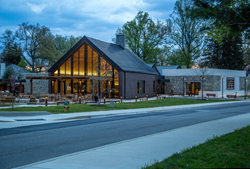 Strategically located adjacent to the wounded warrior barracks, known as Tranquility Hall, the Warrior and Family Center at Bethesda has been a critical part of the healing process and integral in the non-clinical needs of wounded warriors as they prepare to transition to civilian life. It has served as a refuge for the day to day struggles of recovery and an inviting place for troops and their families to recharge both mentally and physically. The USO Warrior and Family Center’s primary role was to support the troops being treated at the medical facilities and their families, but it’s quickly expanded and now functions as a central gathering place and hub of activity for the entire community. Whether it is free Wi-Fi or meals, or a bigger initiative like a celebrity visit or kids after school programing, the location has filled the needs of all troops and families on Bethesda’s campus. The center’s rooms have even seen traffic from the medical students training at the hospital who frequently used the space to meet and study. Aside from serving as a tranquil retreat, the center hosted just under 800 programs and events in its first year. The Art and Music Studio became one of the most popular rooms for many of them. Challenging experiences, both physical and mental, often bring out creativity that was previously unknown, and the arts space served as a space to tap into that. Open studio time, drawing classes, photography, and creative writing were just a few of the art programs offered every week. Studies have shown that symptoms such as depression, isolation, suicidal thoughts, anxiety, chronic pain and insomnia are reduced dramatically when service members and their caregivers participated in such art activities because they were able to express positive feelings, externalize difficult emotions and gain insight in a creative and freeing way. Capt. David A. Bitonti, United States Navy, Commanding Officer, Naval Support Activity Bethesda similarly echoed, “Over the last year, the USO Warrior and Family Center at Bethesda has become an essential part of the fabric of Naval Support Activity Bethesda. The services they provide to our service members and their families are an integral part of what we do in creating an environment that enables patients to heal, staff to thrive, and guests to feel at home. We look forward to many more years of their outstanding support." The challenges of military life do not end when deployment does. From training and constant preparation to reintegration and rehabilitation, the sacrifice of a serviceman or woman endures. For this reason, the USO remains committed to helping our troops and their families throughout their service – making every moment count – whether they are deployed or returning home. The center’s more than 200 dedicated volunteers have truly made the USO’s spirit-lifting mission at this location possible. Aside from their regular smiles and warm welcomes, volunteers have gone above and beyond; at times even finding ways to keep the space open during inclement weather. Having the opportunity to celebrate the occasion with lunch and cake is as much about the time they have given, as the structure itself. The center was made possible in part because of the generous support of the American public and our partners. Their contributions have shown their deep commitment to the brave men and women who have selflessly sacrifice so much for this great nation. For a full list of donors, click here. For more information about the USO and how to get involved, visit uso.org. For a complete list of local programs, events and volunteer opportunities, visit usometrodc.org. USO-Metro is a nonprofit 501(c)(3) organization chartered by Congress, and dedicated to “serving those who serve, and their families” in Washington-Baltimore region. It is through the generous financial support of individuals and organizations in the local community that USO-Metro is able to fulfill its mission to “Lift the spirits of America’s troops and their families”. With the help of thousands of devoted volunteers, USO-Metro provides programs and services for active duty troops, their families, wounded, ill and injured service members and their caregivers through its Mobile USO program, six USO Centers, which include two of the largest USO Centers in the world, the Warrior and Family Center at Fort Belvoir and Bethesda, and four USO airport lounges. For more information please visit http://www.USOMetro.org or “Like” us on Facebook and follow us on Twitter by searching USOMetroDC.